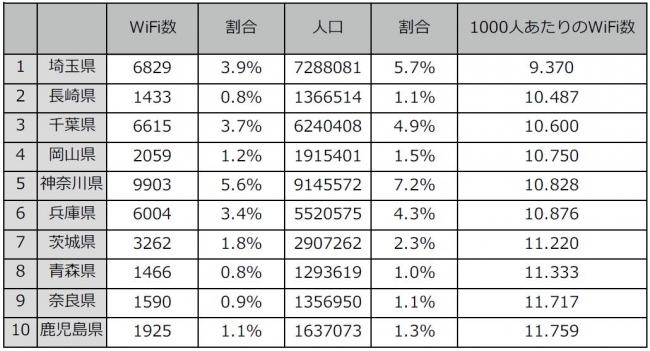 The survey on Wi-Fi spots in Japan, conducted by Town Wi-Fi, the Wi-Fi automatic connection app, finds Tokyo has the most Wi-Fi spots with 23,990, followed by Osaka with 14,036 spots. The worst is Kochi with 862 spots. 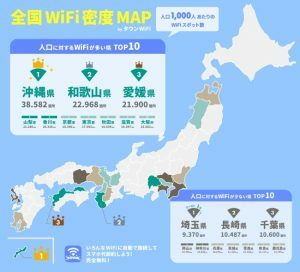 The highest Wi-Fi density is found in Okinawa with 38.502 spots per 1,000 people (5,544 spots in total), followed by Wakayama with 22.968 spots per 1,000 people (2,191 spots in total). Tokyo is 7th with 17.593, Osaka 10th with 15.882. 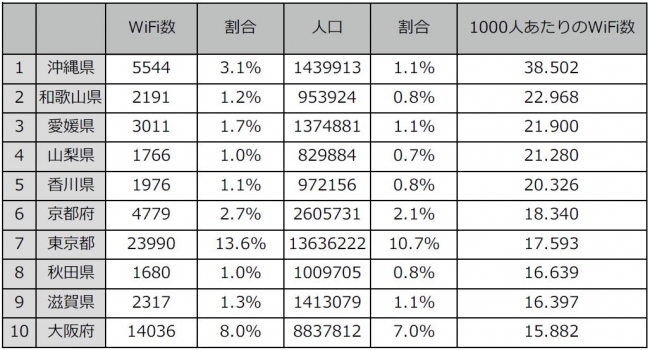 The lowest Wi-Fi density prefecture is Saitama with 9.370 spots per 1,000 people (6,829 spots in total). Chiba and Kanagawa are in the lowest 10. Town Wi-Fi provides 2 million or more automatically-connective Wi-Fi spots in Japan and foreign countries. Through the third-party allocation of shares and additional investments from the incubation fund, Town Wi-Fi has raised 250 million JPY for development of AI-based Wi-Fi authorization, extension of its service globally and development of a marketing tool for Wi-Fi monetization.